Members work with fabric to make wheelchair bags. SWARTZ CREEK — Six fleecy homemade lap blankets are on their way to the Upper Peninsula to warm the hearts and bodies of patients at a veteran’s hospital. They were sewn by Margaret Rubino of Flint Township, as part of an ongoing effort by the American Legion Ladies Auxiliary Unit 294, who have adopted the Oscar G. Johnson VA Medical Center in Ironwood. But many more items and cash donations are needed. Auxiliary members have been working since last month to fill an immediate request for 35 lap blankets, 25 afghans and 20 wheelchair/ walker bags, said Rubino, the group’s secretary. The relationship with the VA hospital began in February when auxiliary members hand made 100 Valentines bearing captions such as “My Hero” and wanted to give them to someone who’d appreciate them, said Jolene Balars, auxiliary president. Rubino researched online and learned that the VA hospital in Ironwood has sporadic volunteer help but many unmet needs. 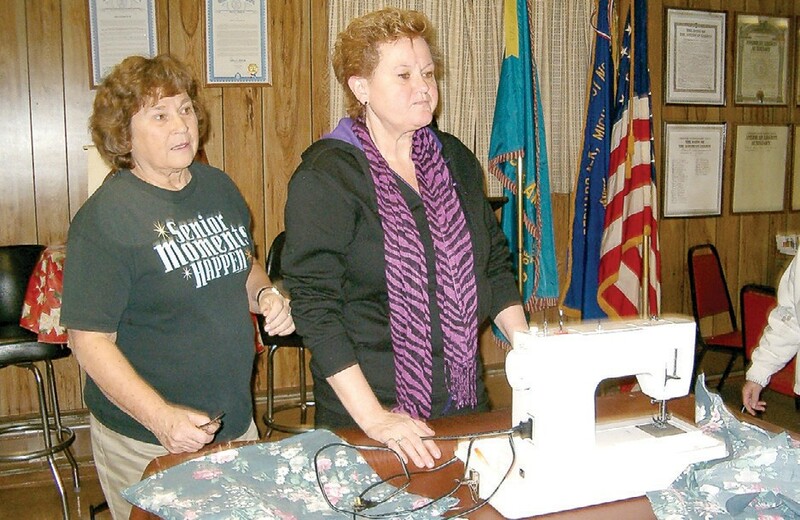 President Jolene Ballard, right, and an auxiliary member at the sewing machine. For 35 lap blankets alone at $15 each, costs quickly add up, she said. 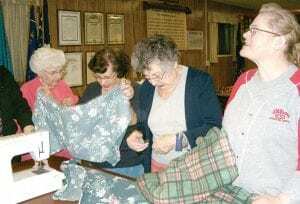 Money for materials for the six blankets Rubino made came out of the auxiliary’s funds raised via parties, craft shows and other fundraisers. For this latest project, the auxiliary is seeking help from the community. They are looking for donations of ready-made afghans, yarn to make afghans and volunteers willing to make afghans according to specifications received from the hospital. Balars said about half of the auxiliary’s 101 members either knit or crochet so donated yarn would be put to use to make more afghans. Already the Ladies Shawl Mission of St. Mary’s Catholic Church in Swartz Creek, who make over 1,000 shawls a year, have kicked in with a donation of 7 afghans. Donated yarn should be washable and four-ply, Rubino said. Lap blankets need to be about 60 by 53 inches and made of fleece or quilted materials. “They said the guys (in the hospital) are pretty big and the ones they have are not going around them,” Rubino said. Several group members met last Wednesday to get started on sewing the requested bags for wheelchairs and walkers. They are designed to hold magazines and other personal items and are attached to a rail on the walker or wheelchair by a Velcro flap. The women were working with materials donated by a member to make the 16 X 19-inch bags but ongoing donations still are needed. Rubino said she can provide the specifications for anyone willing to help make blankets or afghans. Balars said contributions can be dropped off at 7 p.m. on Thursdays at the American Legion Hall, 3440 Morrish Road, Cash donations should be mailed to: American Legion Ladies Auxiliary 294, P.O. Box 66, Swartz Creek 48473. For more information, call and leave a message at 810-635-7333. “It’s a never-ending project,’’ said Balars, adding that group members plans to meet monthly for about four hours to work on the project. The Oscar G. Johnson VA Medical Center serves over 33,000 veterans from a 32-county area in the upper peninsula of Michigan and northeastern Wisconsin, according to information on its website.